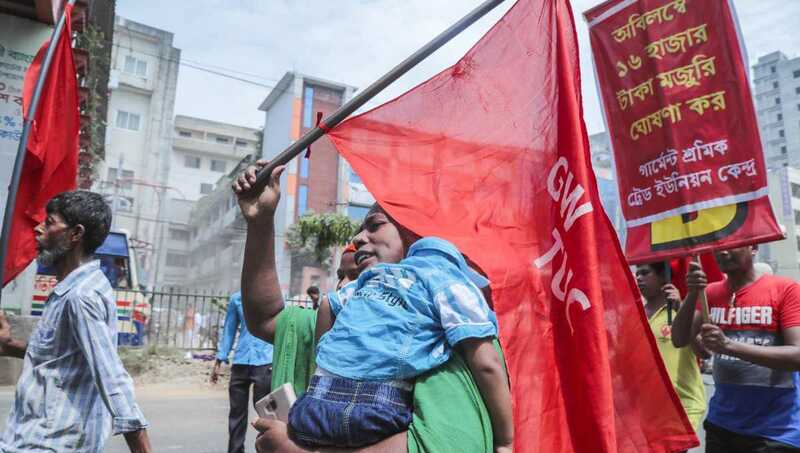 Photo: One of the protesting RMG workers carrying her baby in a rally towards the Labour and Employment Ministry on Wednesday. Dhaka, Sept 19 : Garment workers will demonstrate in their factory areas across the country on September 21 protesting the fixation of minimum wage at Tk 8, 000 by the government and demanding its re-fixation at Tk 16,000. They also decided to continue their protest rally until the government fulfills their demand. Garment workers under the banner of ‘Garments Workers’ Trade Union Centre (GWTUC) ‘, a platform of RMG workers, announced the decision when police stopped their rally towards the Labour and Employment Ministry on Wednesday noon to submit a memorandum seeking reconsideration of the minimum wage fixed by the government. Jolly Talukder, general secretary of the organisation, also announced to hold another protest rally in front the Jatiya Press Club on September 28. “If the government doesn’t fulfill our demand, we’ll continue our protest programme to realise our demand of minimum wage of Tk 16,000,” she said. Jolly Talukder said the government’s decision over the RMG workers’ minimum wage is ‘inhumane’. “Workers’ minimum wage must be Tk 16,000 considering the growing prices of essentials,” she said. Earlier, they held a brief protest rally in front of the Press Club with its former executive president Sadiqur Rahman Shamim in the chair. GWTUC international secretary Manzur Moen, its Gazipur district unit general secretary Jalal Hawlader, Narayangonj district unit president MA Shahin and Savar-Ashulia unit general secretary Khairul Mamun Minto, among others, addressed the rally. On September 13, the government fixed the minimum wage for the RMG workers at Tk 8,000. The decision will come into effect in December next after the publication of a gazette notification. The workers’ wages were last raised in 2013. Bangladesh is the largest exporter of readymade garment products, after China. The sector employs an estimated 40 million workers, mostly women, and contributes to more than 80 percent of Bangladesh’s export earnings.